We performed our "Anything Goes" spring concert at three venues on the central coast, Newport, Lincoln City and Yachats, in April and May of 2017. We sang a very eclectic concert with several folk songs (Early One Morning and A Red, Red Rose), a couple of challenging pieces from modern choral composers (Eric Whitacre's Water Night and John Taverner's A Song for Athene) and even a bit of Broadway (A Sondheim Celebration Medley). The Women of Note joined us as usual. Perhaps their most popular piece this time around was Gordon Sumner's Fields of Gold. You might know the composer better by his stage name, Sting. It is a lovely, haunting piece that showcased the individual talents of several of our Women. It was a satisfying wrap up to a very full year of rehearsals and performances. A very busy arts schedule in February in Newport made scheduling our late winter concert a little problematic. Since we were having trouble finding an open weekend, we decided to do a Mardi Gras event on Fat Tuesday itself. We were a little worried about getting people to come out on a Tuesday night but it turned out to be a huge success. The chorale sang several Moses Hogan spirituals as well as a challenging Brubeck piece. Women of Note continued the jazzy theme with Take Five and The Java Jive. And our special guests, Dixieland septet The Shoreline Stompers, absolutely tore it up with a world premier composition The Hallelujah Sweet Georgia Brown Chorus. After a rousing rendition of Oh When the Saints Go Marching In, the Chorale led a New Orleans style second line parade, complete with hand decorated parasols, into Geneva Hall. We sold a scrumptious array of decadent desserts and held a silent auction for the umbrellas. Proceeds raised will go to our Youth Choral Scholarship fund. Such a fun evening! The weekend after our Messiah concerts with the NSO we presented our own holiday concerts. We sang our annual Wishes and Candles programs at The Commons in Yachats on Saturday night and at the Performing Arts Center in Newport on Sunday afternoon. We sang a selection of holiday pieces including John Rutter's "Blow, Blow, Thou Winter Wind" and Jan Sweelinck's "Hodie Christus natus est." Women of Note performed three pieces including a jazzy rendition of "Snowfall." Forest Fisher stopped being a tenor for one song to solo on soprano sax for "Dark Is the Night." The highlight of the program was Vivaldi's Gloria accompanied by our guest orchestra. Karin Bigler, Becca Bishop, Chris Mckenney, Katrina Theodore and Ulla Mundil stepped out from the group to perform the solo sections. And, as always, we were so lucky to have Milo Graamans accompanying us on piano and harpsichord. We were so pleased to be asked to once again join the Newport Symphony Orchestra for their holiday concert. This year we combined forces with the Willamette Master Chorus under the baton of their conductor, Dr. Paul Klemme. The orchestra played beautifully and the four soloists were just wonderful. It was a treat to be able to sing Handel's classic score in such a welcoming environment. We thank all of you who came out to fill the PAC for both performances. 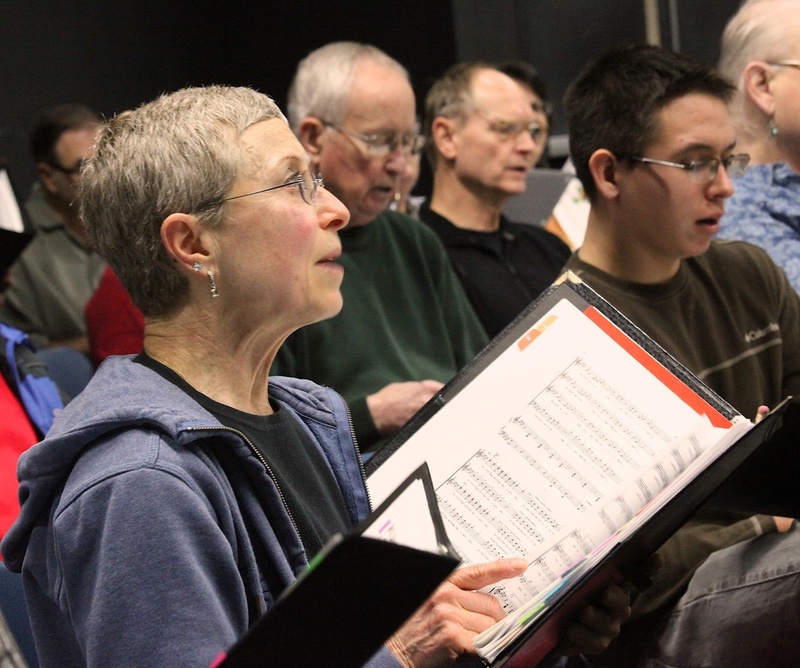 When Mary Lee realized that the first date of our spring concert series coincided with Earth Day, she decided to put together a program celebrating the beauty of nature and the wonders of our world. We sang of moons and oceans and earth and sky. We sang our responsibility for this world and how fragile it is. We danced our unity with all life. As our special guest, we invited didgeridoo artist Tyler Spencer of Primal Tones in Newport to join us on stage. Tyler explained the ancient instrument, played a solo for us and accompanied us on "Crescent Moon." Women of Note added an international flare with pieces from Spain and Finland. Perhaps the high note of the concert was the chorale recreating the sounds of a thunderstorm with snaps and claps in Eric Whitacre's "Cloudburst." We were so pleased to be able to perform this concert in four coastal towns. Waldport, Yachats, Newport and Lincoln City all gave us a warm welcome and nearly full houses. A great week for choral music on the coast! The Central Coast Chorale joined the Newport Symphony Orchestra and the Corvallis Repertory Singers under the baton of guest conductor Steven Zielke for an exciting and challenging holiday concert. The program included The Bach Christmas Cantata, Morten Lauridsen's Lux Aeterna, Handel's For Unto Us a Child is Born as well as a selection of carols both with the orchestra and a cappella. December 6 at the Newport First Presbyterian Church. We had a full house to for our annual holiday concert. 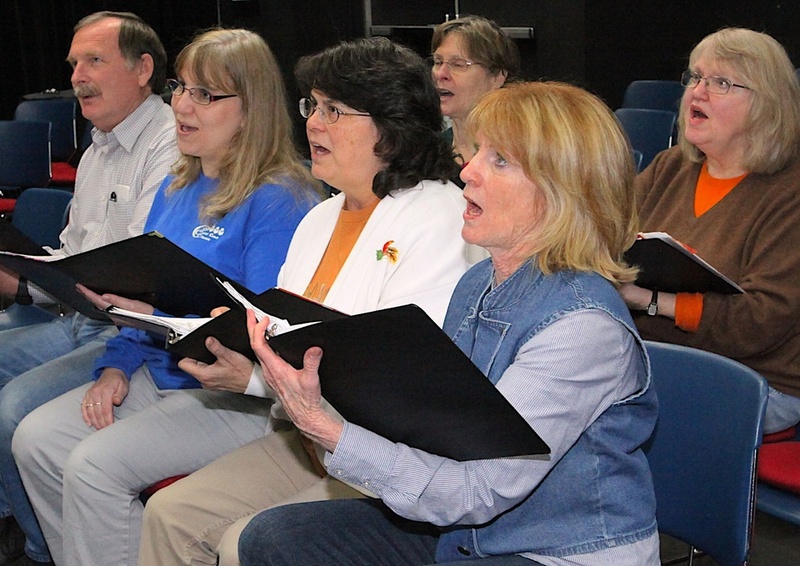 In addition to the chorale and Women of Note, the Oregon Coast Community College choir class performed. Great concert! A few pictures from previous seasons' performances and rehearsals.